The updated Intercom integration lets you sync lists as well as segments saved in your Intercom account. It also allows you to sync your customers along with their properties from Intercom, and create custom segments with those properties. Now, you have more power in deciding how data will be exchanged between Intercom and Retently. One of the major benefits of the updated integration is that you can already use Intercom segments to filter the audience in your NPS campaigns. Let’s check what’s new in our native Intercom integration! You can find the integration on the Integrations page, here: https://app.retently.com/settings/integrations. If you have it already connected, you will see the Settings button, instead of Connect. Custom segments created in Retently using Intercom properties will have a yellow icon. Menu: Clicking on the arrow icon next to the Sync now button will open the Segment menu with an option to activate the auto-sync, which will update your customers automatically. Create a new segment button: Allows you to create a new custom segment, using properties from Intercom, and applying additional filters. Menu button: By clicking on the arrow icon next to the Refresh data button, you will open the menu, which allows you to access the integration Settings page, connect another account, and disconnect the integration. On this page, you can adjust the integration settings and configure the data exchange between Retently and Intercom. These settings will apply to all your lists and segments. Export NPS data to Intercom: Choose what NPS data will be automatically imported to Intercom and applied to your contacts. That can be the NPS score only, or the score and feedback, or you can choose to skip the NPS data import. Trigger an event in Intercom: If a customer unsubscribed from surveys, or was deleted from Retently, you can trigger an event in Intercom. 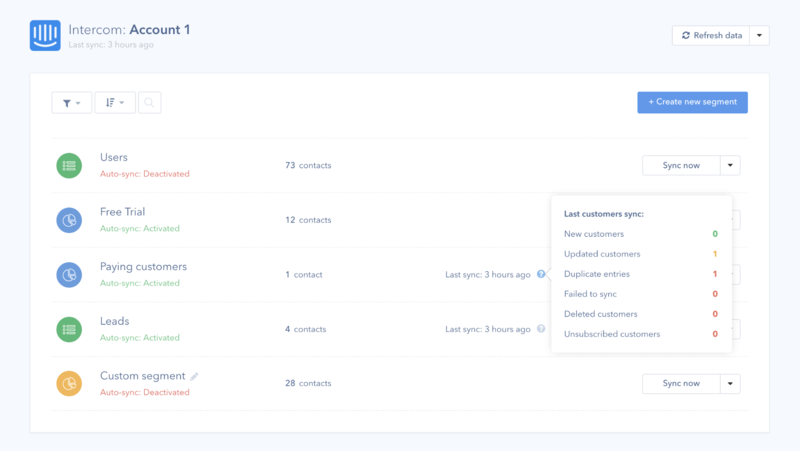 Overwrite contact data in Intercom: Choose what customer data shall be overwritten in Intercom based on data updates in Retently. Overwrite contact data in Retently: Choose what customer data shall be overwritten in Retently based on data updates in Intercom. When a customer is deleted in Intercom: Decide what should Retently do with a customer if they have been deleted in Intercom. When a customer is unsubscribed in Intercom: Decide what should Retently do with a customer if they have unsubscribed from Intercom messages. You can access the Settings page from the menu, next to each segment’s Sync now button on the main integration page. Your contacts have a list of properties in Intercom, such as name, email address, country etc. Retently will map some of these properties automatically, while you will have to map other manually. If you have a property in Intercom that is not listed in Retently’s default properties list, for instance: “Free Trial”, that’s ok, because you can create a custom property and map it to the existing one in Intercom. Mapping a property means that you select it to be imported to Retently and applied to customers. Mapping also helps Retently understand what is this property, and how should it be named in your account. You will be using the customer properties when creating custom Intercom segments, or when filtering the audience for your NPS campaigns. Once you have mapped customer properties and helped Retently understand what are they, you can create additional filters and decide what contacts will match this segment or list, the one that you are currently configuring. If you don’t create additional filters, then all your contacts from this list or segment will be synced with Retently, with the properties that you have mapped. On this tab, you can decide how duplicates are handled by Retently. We recommend keeping the Update option, which will make sure that your customer data is synced between Intercom and Retently. Here, you can also apply a custom tag to your clients, so, later on, you will be able to use it to filter your customers or NPS data. A pop-up will ask you to give the segment a name (which you can rename later if needed) and choose where should the contacts be imported from Users or Leads. Defining the contacts source is important because each segment is created based on the customers and properties from a specific main list. In Intercom, by default, there are two main lists: Users and Leads. You can sync lists and segments, individually, from the main integration page. This can be done automatically, by clicking on the Sync now button, or you can activate the auto-sync option and let Retently sync them automatically, on a regular basis, every 24, 12 or 6 hours, depending on your subscription. You can have the auto-sync activated for a specific number of segments, which is proportional with the number of NPS campaigns you can create in your account.